A red–pink, Gram-negative, rod-shaped, non-motile, non-spore-forming bacterium, designated strain DK6-37 was isolated from the permafrost region of Qilian Mountains in northwest of China. Phylogenetic analysis based on 16S rRNA gene sequencing indicated that this isolate represents a novel member of the genus Hymenobacter, with low sequence similarities (<97 %) to recognized Hymenobacter species. Optimum growth was observed at 28 °C, pH 7.0 and 0 % NaCl. The strain was found to contain MK-7 as the predominant menaquinone. The polar lipids were identified as phosphatidylethanolanmine, two unknown aminophospholipids, one unknown aminolipid and three unknown polar lipids. The major fatty acids were identified as summed feature 3 (C16:1 ω7c/C16:1 ω6c as defined by MIDI), summed feature 4 (anteiso-C17:1 B/iso-C17:1 I), C16:1 ω5c, iso-C17:0 3-OH, iso-C15:0 and C18:0. The DNA G + C content was determined to be 67.4 mol %. 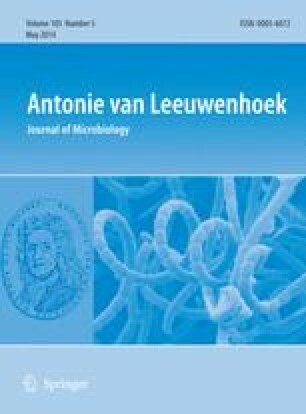 On the basis of the polyphasic evidence presented, it is proposed that strain DK6-37 represents a novel species of the genus Hymenobacter, for which the name Hymenobacter qilianensis sp. nov. is proposed. The type strain is DK6-37T (= CGMCC 1.12720T = JCM 19763T). The online version of this article (doi: 10.1007/s10482-014-0155-y) contains supplementary material, which is available to authorized users. This study was supported by the National Special Research Fund, China (Gas Hydrate Resource Exploration and Production Testing Project.Grant No. GZHL20110308, GZHL20110323).